Frederick Douglass was a fierce critic of America, a radical patriot and an abolitionist who was formerly enslaved. A new biography sheds light on the lesser-known corners of Douglass’ life. Behold, I have put my words in your mouth . . .
How Americans react to Douglass’s gaze, indeed how we gaze back at his visage, and more important, how we read him, appropriate him, or engage his legacies, informs how we use our past to determine who we are. Douglass’s life and writing emerge from nearly the full scope of the nineteenth century, representative of the best and the worst in the American spirit. Douglass constantly probed the ironies of America’s contradictions over slavery and race; few Americans used Shakespeare and the Bible to comprehend his story and that of his people as much as Douglass; and there may be no better example of an American radical patriot than the slave who became a lyrical prophet of freedom, natural rights, and human equality. Obama channeled Douglass in his dedication speech; knowingly or not, so do many people today. 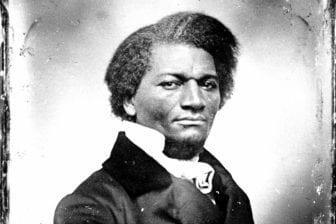 Born Frederick Augustus Washington Bailey, a slave, in Talbot County, Maryland, in February 1818, the future Frederick Douglass was the son of Harriet Bailey, one of five daughters of Betsy Bailey, and with some likelihood his mother’s white owner. He saw his mother for the last time in 1825, though he hardly knew her. She died the following year. Douglass lived twenty years as a slave and nearly nine years as a fugitive slave subject to recapture. From the 1840s to his death in 1895 he attained international fame as an abolitionist, editor, orator of almost unparalleled stature, and the author of three autobiographies that are classics of the genre. As a public man he began his abolitionist career two decades before America would divide and fight a civil war over slavery that he openly welcomed. Douglass was born in a backwater of the slave society of the South just as steamboats appeared in bays and on American rivers, and before the telegraph, the railroad, and the rotary press changed human mobility and consciousness. He died after the emergence of electric lights, the telephone, and the invention of the phonograph. The renowned orator and traveler loved and used most of these elements of modernity and technology. Douglass was the most photographed American of the nineteenth century, explained in this book and especially by the intrepid research of three other scholars I rely upon.2 Although it can never really be measured, he may also have been, along with Mark Twain, the most widely traveled American public figure of his century. By the 1890s, in sheer miles and countless numbers of speeches, he had few rivals as a lecturer in the golden age of oratory. It is likely that more Americans heard Douglass speak than any other public figure of his times. Indeed, to see or hear Douglass became a kind of wonder of the American world. He struggled as well, with the pleasures and perils of fame as much as anyone else in his century, with the possible exceptions of General Ulysses S. Grant or P. T. Barnum. Douglass’s dilemma with fame was a matter of decades, not merely of moments, and fraught with racism. The orator and writer lived to see and interpret black emancipation, to work actively for women’s rights long before they were achieved, to realize the civil rights triumphs and tragedies of Reconstruction, and to witness and contribute to America’s economic and international expansion in the Gilded Age. He lived to the age of lynching and Jim Crow laws, when America collapsed into retreat from the very victories and revolutions in race relations he had helped to win. He played a pivotal role in America’s Second Founding out of the apocalypse of the Civil War, and he very much wished to see himself as a founder and a defender of the Second American Republic. In one lifetime of antislavery, literary, and political activism Douglass was many things, and this set of apparent paradoxes make his story so attractive to biographers, as well as to so many constituencies today. He was a radical thinker and a proponent of classic nineteenth-century political liberalism; at different times he hated and loved his country; he was a ferocious critic of the United States and all of its hypocrisies, but also, after emancipation, became a government bureaucrat, a diplomat, and a voice for territorial expansion; he strongly believed in self-reliance and demanded an activist-interventionist government at all levels to free slaves, defeat the Confederacy, and protect black citizens against terror and discrimination. Douglass was a serious constitutional thinker, and few Americans have ever analyzed race with more poignancy and nuance than this mostly self-taught genius with words. He was a radical editor, writer, and activist, informed by a hard-earned pragmatism. Douglass was Jim-Crowed more times than he could count, but loved the Declaration of Independence, the natural-rights tradition, and especially the reinvented US Constitution fashioned in Reconstruction. He fought against mob violence, but believed in certain kinds of revolutionary violence. In his own career he heroically tried to forge a livelihood with his voice and pen, but fundamentally was not a self-made man, an image and symbol he touted in a famous speech, and through which modern conservatives have adopted him as a proponent of individualism. He truly believed women were equal and ought to have all fundamental rights, but he conducted his personal life sometimes as a patriarch in a difficult marriage and while overseeing a large, often dysfunctional extended family. Indeed the old fugitive slave has become in the early twenty-first century a malleable figure adopted by all elements in the political spectrum, not least by current Republicans, who have claimed Douglass—quite ahistorically—as their own by elevating a single feature of his thought, black self-reliance, at the expense of his enduring radicalism. At the unveiling ceremony of the statue of Douglass in the US Capitol in 2013, chosen by the District of Columbia as one of the two representatives to which each state, and the District, are entitled, congressional Republicans walked around proudly sporting large buttons that read FREDERICK DOUGLASS WAS A REPUBLICAN.3 Douglass descendants present, as well as some of us scholars with, shall we say, different training and research, smiled and endured. Whose Douglass? is a modern question rife with meaning. This book seeks Douglass’s complexity in all its forms, but never sidesteps his essential radicalism in a search for heroes we can hold dear and in common. Douglass was and is a hero; he has been all but adopted as a national figure in Ireland, Scotland, and Britain. His Narrative is read all over the world. He has appeared in countless murals, satirical political cartoons, twenty-first-century works of fiction, in paintings, and in a great deal of poetry. The sheer complexity of his thought and life makes him an icon held in some degree of commonality. He was brilliant, courageous, and possessed a truly uncommon endurance. He wrote many words that will last forever. His literary genius ranks with that of many of America’s greatest writers of his century. But he was also vain, arrogant at times, and hypersensitive to slights. He did not take well to rivals who challenged his position as the greatest spokesman of his race, although he also mentored many younger black writers and leaders. He liked being on a pedestal and did not intend to get knocked off. Douglass was thoroughly and beautifully human. Above all, Douglass is remembered most for telling his personal story—the slave who willed his own freedom, mastered the master’s language, saw to the core of the meaning of slavery, both for individuals and for the nation, and then captured the multiple meanings of freedom—as idea and reality, of mind and body—as perhaps no one else ever has in America. From the book FREDERICK DOUGLASS: Prophet of Freedom by David Blight. Copyright © 2018 by David Blight. Reprinted by permission of Simon & Schuster, Inc. All Rights Reserved. The Guardian: “David Blight on Frederick Douglass: ‘I call him beautifully human’” –– “David Blight arrives in New York pulling his carry-on luggage, en route from Washington, soon to fly onwards to San Francisco. Such is the interest in his new biography of Frederick Douglass, a book 10 years in the writing and a whole career in the making, he will be on the road till December. “He takes off his lovingly battered Michigan State cap, picks up a coffee and sits down for another conversation.